We can Twitter ’til we flitter and Facebook ’til we face plant and that won’t matter much in the greater scheme of things if we fail at our single most important job—writing a great book. Our single greatest challenge is to hook the reader hard enough to buy (and then read) our novel. Sales ultimately are impacted by reviews and if no one reads and no one finishes? Yes, covers are important and social media is vital, but those sample pages can mean the difference in No Sale and Big Hit. One writing book every writer should have is Hooked by Les Edgerton. I think this was the first craft book that truly woke me up and showed me all I really didn’t know about writing. As a new author, there were far too many elements I believed were important when in reality? Not so much. Additionally, because I was focusing on the wrong “stuff” I was failing to develop the “right” stuff. What I love about Hooked is how Les demonstrates how all the factors that go into making great beginnings don’t just evaporate. These are tactics we must keep employing throughout the work to keep the reader engaged and turning pages. Our job is to obliterate sleep, to send our readers tired and grouchy and over caffeinated to work…but ultimately satisfied. Let’s talk about some common ways beginnings fall flat. Okay, then cut off 49 pages and you’re golden. Modern audiences simply don’t have the attention span for us to go on too long. Yes, I get that the authors of yesteryear got away with this, but they were competing against shoveling manure and shoeing horses, not YouTube, Facebook and 24-hour entertainment. Additionally, writers back in the day were often paid by the word, so that sucker was padded worse than a freshman term paper. These days we need to get to the point as quickly as possible and fiction is about one thing and ONE thing only. Problems. We writers can be really guilty of brain-holding. Readers are smart. Really. We don’t need to go ten or twenty or fifty pages to “set up” the story problem so the reader doesn’t get lost. That is my considered opinion. Weir doesn’t start with the crew landing on Mars and bonding and working to “set up” the sandstorm that strands Watney on Mars. He starts right in the guts of the problem and we (readers) keep up just fine. Often new writers will begin a novel with a lot of telling and flashbacks in an effort to explain why a character is a certain way. We don’t care. That is the realm of psychotherapy, not fiction. Want to see who a person (character) really is? Toss them into a problem. Sure, later in the story we can divulge the character was abused or abandoned or whatever, but the beginning is not the place for that. Yes, we eventually know that Connelly’s character Detective Hieronymous Bosch grew up an orphan after his mother (a prostitute) was murdered. We eventually find out that these circumstances fueled Harry’s choice in occupation and even his world view. But the Bosch books never begin with this. That is for later. Because the past is in the past and cannot be changed, therefore it is not a story worthy problem. It is a bad situation, not true drama. In fact, we as the writer need to know these details, but sharing them might not always be a good thing. Hannibal was far more interesting before he was explained. Readers are perfectly fine with meeting a fully formed character (flaws and all) and just rolling with it from there. In fact, the wondering why a character thinks or acts a certain way often drives the reader to turn pages hoping that it eventually will be explained. My previous point dovetails nicely into inner demons, which we will explore in another post for sake of brevity. I get a lot of novels that begin with thinking and more thinking and waxing rhapsodic over “inner demons.” Here’s the deal, we don’t like people who go on and on about their personal problems and character flaws in real life. Why would we pay to endure that in print? Fiction is therapeutic, but it isn’t therapy. Remember that we are using the story problem to make the reader care about the protagonist. If we jump the gun too soon and start dumping a lot of emotional baggage on the reader, she is going to feel like she is trapped in the checkout line with that stranger who feels the need to share details of her ugly divorce. We have to earn the privilege of the reader caring. Beginning with thinking and internalization presents a structure problem as well. Internalization is part of what is called a sequel. Sequels can only happen as a direct consequence of a scene. Scenes are action and goal-oriented. All fiction begins with a scene (problem/conflict). Humans feel far more comfortable with outer problems (initially) and it is what draws us in. If you have ever visited a major city like NYC, then think of it this way. On the sidewalk there are countless faceless people. If we notice someone crying? We might (big on the might) get involved, but we wouldn’t feel very comfortable. If, however, a person is carrying a briefcase and the latches give way spilling out the contents? Most of us wouldn’t think twice about helping the person gather her papers. We also would feel far less weird if after we helped gather the papers, we “found out” the person was discombobulated because she was upset over a personal problem (was just fired). We might even want to know more because we’ve established enough report to activate empathy. This is the difference in using an outer problem to hook versus inner drama. Good fiction goes right to a tangible outer problem. Any time I see a book that opens with a funeral, a death, a hospital scene, I cringe. This is going to sound cruel, but we really just don’t care. If we have not been introduced to the characters who are clinging to life or recently deceased? We have nothing emotionally vested and so sections like these are just tedious. ***This goes along with a protagonist starting things off by relaying her abuse history as a child. And the more the writer tries to amp up the “feelings” the weirder it gets for the audience. I get that the story might be prompted by a death or a tragic event, but there is no reason to drag us along if we don’t know the dearly departed. Remember that even in Star Wars, we did spend at least a little time with Uncle Owen and Aunt Beru before they were butchered. If the story would have started there? It would have just been weird. There are a lot of other things that go into crafting excellent beginnings, but we will talk about those another time. I am trying something new, though. Thursday, June 16th I am holding a Battle of the First Pages. If you’ve ever been to a conference and to an agent gong show, this will be similar. I will upload your first page in the W.A.N.A. virtual classroom (all you need is internet and pants are optional) and will read until the point I would have stopped (or, conversely, where I am hooked). Then we will parse the first page sample for what the writer did well or what could be done better. Sign ups are limited but it is only $25 for two hours of fun and games and the recording is provided for free with purchase. Anyway, I do love hearing from you! What are your thoughts, opinions, questions regarding beginning? Again, I am trying something new and offering an open and interactive workshop. Is your first page strong enough to withstand the fire? Darth Vader, too. And Jedi in general were much cooler before we had to listen to all that twaddle about midichlorians. Even back then, though, it was a good idea to hook them fast. Fitzgerald did Hemingway the invaluable service of telling him to cut the first chapter of The Sun Also Rises and get right to the real story. I just realized that the first fifty pages of my next work in progress needs to edited out! Thanks for the push in the right direction! I am learning so much from your blog, thank you! I clicked on the battle of the first pages and it takes me to a screen for June 16th instead of this Friday. Is there another link or do I have “Memorial Day/ Long-weekend/ sunburned brain” and can’t find it? Thanks for all that you do for the newbies like me. Ugh, oops. I forgot I changed the date on that because tech guy was going out of town. I had to delay it to make sure I could get the technology to work. I am so sorry. That was my mistake. Fixing it now. Good news is you have more time to prep your page 😀 . No, I was the one with long weekend brain. It’s the 16th. Originally I planned for it to be this Friday but worried we wouldn’t have enough sign ups in that short of time to make the class fun. Sorry. But hope to see you the 16th 😀 . No worries! I will catch the next one as I’ll be at a business dinner on the 16th… unless of course I can listen to it later in the evening?? All recordings are available :D. And you really don’t HAVE to be there for the feedback on first page because I won’t allow much defense 😛 . I haven’t read Hooked, but I have read The Martian. You make a lot of sense. 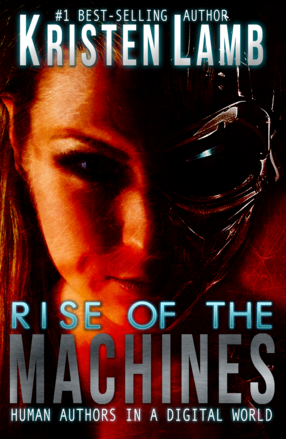 I’m reading Rise of the Machines–Human Authors in a Digital World, and so far, that makes sense, too. So well done to you! No, prologues are kind of their own thing, but I recommend thinking before using them because we will have to hook AGAIN in Chapter One. Here is a popular post I did that explains how to employ a prologue. Thanks for the link. Good news for me! Having committed NO sins, we just might be good to go. On the other hand… still thinking. I personally LOVE prologues, both reading and writing them, but I’ve been told it’s a red flag with agents, so I cut mine. Perhaps I’ll put it back in…. Eh, but it’s in a different POV than the entire book, so it’s kind of obvious…. Haven’t started querying yet so we’ll see where I end up! Love the sound of “Battle of the First Pages” — do we updoad our first page upon registration or on the 16th? You send it to me and I will upload it into Big Blue Button. The welcome e-mail has instructions for what to do 😀 . *facepalm* The chapter I sent you for the “First 5 Pages” class is gonna be one big blob of red ink. I recently noticed that in an Indie book … the author wanted reviews, but didn’t exactly appreciate it when I pointed out that the first 3 chapters were each prologues from POVs of various sub0characters… IMHO, if those 3 initial chapters were cut off and used in blogs, etc., it would raise the book from a 2 to a 4… I don’t review books unless I can give a 3, so didn’t do an ‘official’ review for that book. There’s a saying that I heard from a therapist once, “Once a forest fire has started, blowing out the match won’t help.” She was talking about how trauma can cause patterns of behavior, but it’s the behavior that causes the problems, not the trauma. I think that works in fiction, too. We don’t have to know everything that has led up to the protagonist fleeing a gang of thugs down a dark alley to want to know how she gets away from them. I found your blog just recently, and you crack me up – in the good way. I love how you take the basic information everybody spews and present it in a new, fresh way, PLUS additional knowledge that’s actually helpful. I’m thinking about starting a page called “Learning to Write on Google” and leave sarcastic remarks on the obvious advice constantly given. You will not be on that page, unless the blog is too good to resist. Keep on truckin’ as the kids say. And if it helps, I’ve already linked back to your website because you’re that awesome. I have to add, I’m not usually this nice to people, mainly because it’s not funny…and I don’t like people. But that’s me. Great post. I love how you relate writing/reading to how we respond in real life. Although, after reading this, I need to scrap a lot of my writing and rework! I always think that the inner problem will make the reader connect, but after reading this, I totally get why it is not good to start in a hospital or at a funeral! Make it good NOW. Ain’t nobody got time for later. Reblogged this on Jinxie's World. In theory I’m in full agreement. Write scenes. Don’t write thoughts. But here’s the thing… I’ve just read The Martian (best book in six months by the way and I am normally not a hard sci fi fan) and it is interesting that while it starts with a problem, it does actually start with thinking… thinking about how fucked he is. I fully expected the book to start right in the middle of the action scene where the guy is left on Mars. I was willing to grit my teeth through that because I was sure I’d like the book based on recommendations. But I hate books that start with action scenes. Like with the funerals and hospital scenes you mentioned, I just do not care yet. So, it is strange that we tell beginners to write scenes and start with sensory experience but then some of the best books break the rules. And some of those that do it by the book fail utterly, such as the twenty indie books I’ve opened and read the first ten pages of and deleted in disgust this week alone. They start with action and it is boring. Yes, starting with inner demons would probably be worse. But there is something more here that needs to be discussed. We must start with character. The best way to get character is to show actions, rather than telling internal thoughts. Thats true anywhere in the book. But in the beginning readers need a character to relate to. And every character has got problems. I have read many excellent books that started with a very small problem, often one not all that related to the major story problem. But yes, usually the scene chosen as the starting place is about the character and a problem. (Sometimes authors get away with a sort of prologue, unofficial or not, about setting but increasingly not, for the reasons you mentioned having to do with manure versus YouTube.) So, Pawn of Prophesy, David Eddings initial book in his huge and wildly successful series from way back in the age of dinosaurs started with a kid discussing his life and problems, mainly that his aunt was weird because she had one lock of white hair on an otherwise black head. It’s one of the best hooks I know of for a certain type of readers, readers most focused on character. When I use the term action that is dramatic action, not necessarily a chase scene or fight scene because that goes with the whole “funeral” point. We don’t know who these people are so why do we care? Weir starts in the action because he starts us with a PROBLEM IN NEED OF SOLVING. Yes, it is thinking to an extent,but this is different than just musing about how his life has gone off track. He is also in the process of creating a log entry (ACTION) he is unsure anyone will ever see (SETBACK)…which leaves us on the cliffhanger. The problem (even though he is thinking it—though I would say this is because no one else exists on the planet and most stories don’t involve that scenario) involves Watney being stranded on Mars. It is real and external and has a time limit. Edgerton’s Hooked is one of the dozen or so craft books I keep close at hand and reread from time to time. He does the best job of anyone at explaining what an opening hook should be, and why. Really great post. I’m currently in the middle of a CP’s work and he does pretty much all of these things, plus the dreaded “start the story by staring into the mirror and analyzing what you look like.” Now I’m working on how to point out allll the bad things without sounding too mean. Great post. When I was first learning to write I was told to never open up a story with a dead dog. I’ve never forgotten it. I’ve started with the MC getting lost in a daydream about how her life could/should have been, which gets her into trouble by the end of the first page. It’s not a very action-y start, but it reveals something about the character (she’s a dreamer) and the situation she’s in and the base problem of the story. What do you think? Truthfully I would have to see it. Sometimes we think writers are breaking the rules when they really aren’t (I.e. my The Martian example). Fabulous post. And your New York City example was perfect. Hard to care about characters you just met, but you still probably want them to get out of a burning building. I have been reading your blog for a long time and your advice also made me to be a writer. I have written few titles for children. Now 2 titles are available in amazon.com. “In the trails of the Aboriginals of Australia.” They are free to read on Kindle. If you read them you may like them and you can also advice kids to read and enjoy them. Thank you for all your tips. Thanks for the shout-out of my lil blue book, Kristen. If I may weigh in a bit, one of the problems of writing education is that we employ terms from the lay vernacular that don’t mean quite the same as the layperson does. One such term is “action.” Too often, writers mistake action to mean melodramatic action and want to start off with bombings, murders, kidnapping, et al. In some cases, that’s fine, but usually it’s best to begin with a small, dramatic action that creates a bona fide story problem for the protagonist. An example of such a scene is in the beginning of James Baldwin’s famous short story, Sonny’s Blues, which begins with the protagonist sitting on the subway on his way to work and reading a newspaper. He spots an article about his brother being arrested and that’s his inciting incident–he knows if his brother’s been arrested that’s a death warrant for him. And… it’s an action scene, in literary terms, even though he’s by himself and reading an article. You do a wonderful job in explaining clearly these kinds of things, Kristen! Heard a trick once that works for me. Pretend you’re telling the story to a good friend, someone who knows you and your characters, knows how you think. No detailed background is necessary. This was outstanding. Some very good points made and I think even practiced writers need to be reminded. I thought I’d heard of every good self-help writing book too and then you bring up Hooked, I will be getting that book. Don’t choose me for your unvarnished truth because I don’t have a novel to submit anything… yet. But I wanted to say thank you for sharing some great advice. Going into my 2nd draft, I’m trying to fix up some pacing issues, and I think it starts at the beginning for sure. I too am a huge “Hooked” fan! Mr. Edgerton knows what he writes about and we’re just lucky he’s shared the wealth! Thank you for this, I will be participating in the battle of the first 50. This is my third novel but first sci-fi and I am anxious to know if I’m botching it.. Cant’ wait. Kristen, Thanks for another informative blog. Just finished reading Rise of the Machines–Human Authors in a Digital World, and will re-think my use of social media as a result. I just signed up for Battle of the First Page. I know I need to hook on the first page but it’s a challenge to figure out how – thanks for the book recommendation! Right on. I have put down many a book because of a slow start. Action, baby! I’m interested to know what you think of prologues. I’ve heard they are passe’, but don’t they provide a solution for introducing the main character, who doesn’t appear until page 50? Also, is the June 16 event from 7-9 am or pm? It is in the evening EST. Here is a post on prologues that will hopefully answer your question 😀 . You have summed it all up perfectly! One of my favorite pieces of advice for starting a story comes from Hemingway: “Write the truest sentence you know.” In relevance to the story, this can be a major launching point into the rest of your novel or short story. Personally, I hate any kind of info dumps, so I’m glad you covered that in your post. It is an immediate turn-off for me, and I almost feel insulted when a writer would rather barrage me with facts and back story instead of leaving me to pick up the pieces woven throughout the story. This comes down to the “show, don’t tell” debate (which I actually just covered extensively in my own blog post). Sometimes, leaving a little mystery really creates more depth and tension than filling in all the blanks. Thanks for a great post. I’ve written three books (none yet published) and will go back to look again at the first pages of each. I took your “First Five Pages” course last year (with critique of ms), and I really appreciated the pointers. You identified a couple of problems I couldn’t even see anymore, because I’d gone over it too many times. I’m actually not a novelist…as in not planning to write a book. But as a direct response copywriter, the beginning is hugely important. like…no sale gets made if you don’t hook em’ kind of important. the example of the outer drama vs inner drama to get people involved is super clear and i actually re-read your post again to make sure i understood fully what you meant. definitely reference for the near future! Actually one of the movies almost every woman loves is Sleepless in Seattle. The movie starts of at a grave site. If the death is personal enough, it can make for a great beginning. Movies get to do things that novels cannot. Remember in the movie it is only a couple minutes of a visual and the actors are responsible for conveying emotion. The audience is not in the narrative of the head of the grieving character and THAT is the part that gets emotionally tedious. You have me “hooked” even though I might be traveling that day. I think. I don’t know. Maybe?